Finding the opportunity to stay professionally current and relevant or get the education needed for a career move can be a challenge. Certificate programs provide an excellent way to earn a credential, learn new skills or retool for a job change. 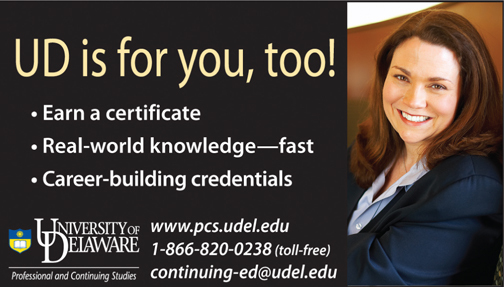 The University of Delaware’s Division of Professional and Continuing Studies offers certificates in the health care, legal, and business fields. These practical programs offer concentrated study in a specific area and can be completed in a relatively short time through part-time study. Beginning in the fall of 2012, the UD Lean Six Sigma Green Belt certificate will transition to a combined online and in-class format, making it more accessible than ever to working adults throughout the region. Past participants in the program indicated that they valued the face-to-face interaction with the instructor and their fellow students, but that they would also welcome the convenience of online learning for particular components of the program. The new format provides a best of both worlds situation. The Project Management certificate will now be available in Dover, Del. beginning in fall, bringing the popular program to a more convenient location for residents of Kent and Sussex counties. Other certificates meet in Wilmington or Newark. Certificates featured at the information session include: Business Analyst, Clinical Trials Management, Financial Planning, Lean Six Sigma Green Belt, Paralegal, and Project Management. Other online programs are available for those seeking to renew their credentials and move ahead in their careers. Health Care Risk Management makes its debut in a completely online format in fall 2012. This program gives an overview of risk management in the health care setting and allows professionals to enter this growing field.